Emeritus Professor Gillian Triggs, the former President of the Australian Human Rights Commission, will speak on the current issues concerning religion and human rights in Australia, including the recent debate on Philip Ruddock's recommendation in the religious freedoms report. 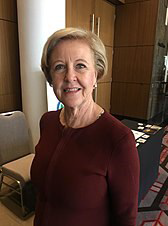 Emeritus Professor Gillian Triggs is the former President of the Australian Human Rights Commission 2012–2017, and the new Chair of Justice Connect, a nonprofit dedicated to connecting people locked out of the justice system with free legal help. She is also Vice Chancellor’s Fellow at The University of Melbourne and Vice President of the Asian Development Bank Tribunal.